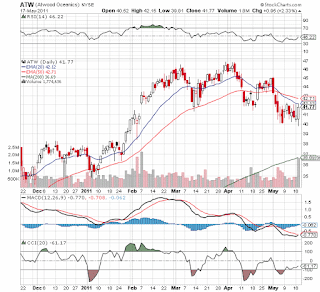 Interesting trading today in Atwood Oceanics (ATW) after what started as another weak day. Competitors like Transocean (RIG) ended lower, and Diamond Offshore (DO) and Seadrill (SDRL) ended basically flat on the day while ATW rallied 5.5% off the lows to end close to the highs. Possibly ATW is getting a bid due to takeover speculation or possibly its positive news on the new drillship. The Atwood Osprey was expected to arrive on location in Australia in mid-May. This will be there first ultra-deepwater rig with a depth of 8,200 feet. Also, with day rates at $490K and a small fleet the revenue will be a huge increase for Q3. 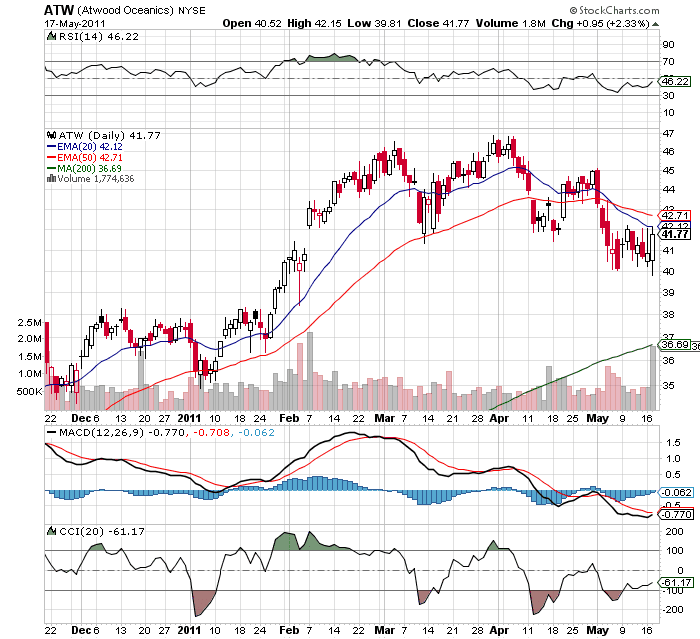 Either way hopefully ATW holds up as other stocks in the general sector continue to fold.